How to Delete Songs & Albums from iPhone XS Max/XS/XR/X etc? How to Delete Songs & Albums from iPhone XS Max/XS/XR/X/8/7 etc? 3 ways will walk you through how to delete iPhone music & albums to free up iPhone for iOS update, more photos, apps, videos, etc. Are you wandering in the ocean of Apple music and amassing a sizeable offline music collection on iPhone? Sorry to disturb you, but your iPhone's storage space is running out! You have to stop your journey and delete songs from iPhone to release iPhone in case that you need to update iOS or save more apps, games, photos, videos, etc. 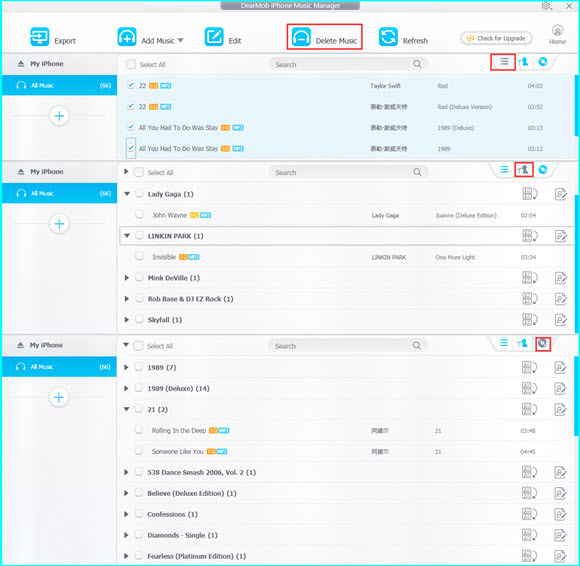 So, here we gather 3 easy ways to teach you how to delete songs from iPhone 5/5S/SE/6/6S/7/8/X/XS Max/XS/XR in a couple of moment. Please choose any of the 3 options you are more comfortable with to remove songs from iPhone. Step 1. Open Settings -> tap General -> tap Storage & iCloud Usage -> open Manager Storage. Step 2. When you access Storage, you can see a white icon with multicolored musical note, that's iPhone native music app, just tap it. Step 3. Delete music from iPhone. In the Apple Music app here, you can see all the downloaded Apple music on your iPhone, just tap Edit on the top right corner of your iPhone to delete songs. * Delete all songs: Tap the red deletion icon to see the Delete icon on the right side of All Songs. 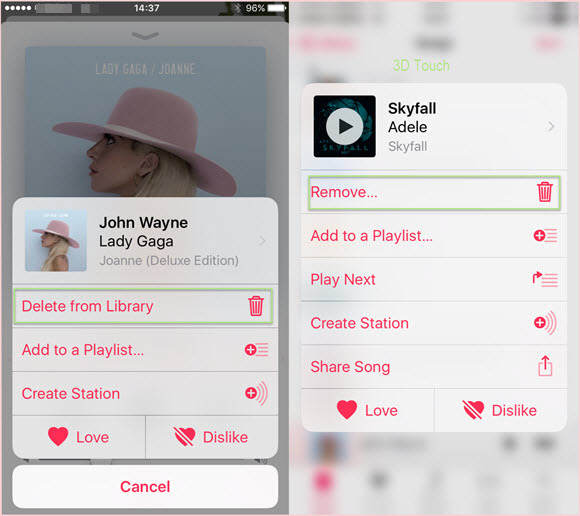 Once you touch the Delete, all downloaded songs, albums or artists will be removed from the Music app as well as your iPhone to fresh your music library completely. * Delete an artist's songs: Choose one of the artists in the list, and then tap Delete. All the songs from the certain artist will be removed. *Delete all songs or all songs from an artist once for all. * Can't choose one or two songs from an artist to delete. * Delete one artist by one artist. * Only delete downloads while not affect iCould Music Library collection. Step1. Open your Apple Music app on the main UI of your iPhone. Step 2. Go to Library to choose which songs you want to remove. Here, you can see your music songs are classified by Playlists, Artists, Albums, Songs, etc. Step 3. Delete iPhone music. * Delete Playlists: Tap Playlists and choose one type like Recently Played to delete. Tap the icon on the top right corner of the songs list, and then choose Delete from Library. * Delete Artists: Choose one artist, and you will find that the artist's songs are categorised by album. You have to delete songs one album by one album. This also can be applied to deleting songs from Albums. * Delete Songs: Deleting iPhone songs here is time-consuming indeed as you have to remove songs one by one. Besides, you have to scroll down the page to find the specific song if it lays at the bottom. If you are using iPhone 6S or later, you can just press an item to use 3D touch to access Remove tab as the song will play first before deletion. Notice: Removing iPhone songs through Apple Music will allow you to do something to songs that haven't been downloaded. You can just choose the item and tap "Delete from Library" to clear the cache. * Delete songs from iPhone while listening. * Can't delete all songs from iPhone by an artist or album. * Remove iPhone music one by one. 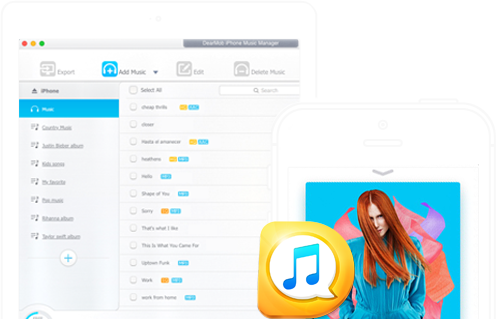 DearMob iPhone Music Manager is a free tool to help delete songs from iPhone at one's pleasure without iTunes syncing. By detecting the internal world of your iPhone and showing the original condition of Apple Music, it helps you manage your songs as easy as ABC. You can selectively choose which song or songs, artist and album to delete in a click. Besides deleting, you can also transfer Apple music to computer for backup and add self-made tracks, ripped CD music, downloaded MP3 AAC FLAC songs, etc to iPhone without restrictions. 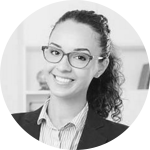 Please remember it is privacy guaranteed and 100% safe without data losing. Step 1. Free download DearMob iPhone Music Manager, install and launch it on your computer. Step 2. Connect your iPhone to computer with Apple original USB cable which can prevent the sudden disconnection. Once connected, there is a "Trust this computer" message popping up, just tap "Trust" to continue. Step 3. Delete songs from iPhone in three ways. 1. By Music list. Here you could select a specific song or all songs to delete. 2. By Artist. Here you could choose an artist to delete all her or his songs in a click. 3. By Album. You can choose a certain album or albums to delete the music. * Please remember to click Sync for successful deletion everytime you click Delete Music. * If you want to remove DRM songs from iPhone, please logout your Apple ID. * Please make sure that you have installed iTunes 12.5.1 or newer on your computer. Do not want iTunes? Just upgrade DearMob iPhone Manager to the pro version to get rid of iTunes and get more features. * Selectively delete iPhone songs, artists and albums at will. * Transfer iPhone songs to computer for backup before deletion. * Remove DRM from iTunes & Apple music. * Add ripped CDs music and downloaded songs from apps to iPhone. * Edit iPhone music info and make ringtone. * Need installation on computer first. Your selected music are now gone from your iPhone. 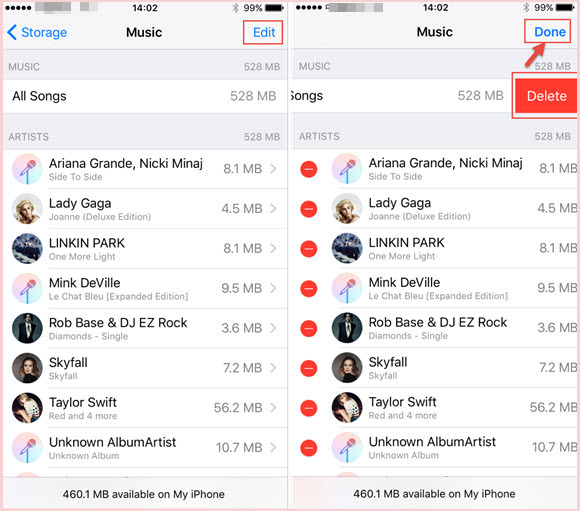 Advisably, we suggest you to use DearMob iPhone Music Manager to backup iPhone songs to computer before deletion in case that you want to retrospect these iPhone songs while there is no WiFi. 1 How to Free Add MP3 to iPhone? Finding a way to add MP3 to iPhone 8/7/6S/6 etc from your vast MP3 music collections on computer? There are two free ways including iTunes syncing for you to add MP3 songs to iPhone to enjoy on the go. 3 How to Copy Music from iPhone to Mac?